Making a purchase order could not be easier. Just browse our products and click on any items that you wish to buy and put them in to your shopping basket. 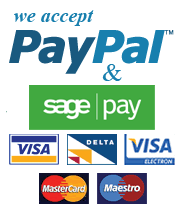 We accept credit and debit card payment via Sagepay Protx. We accept payment also via Pay Pal.